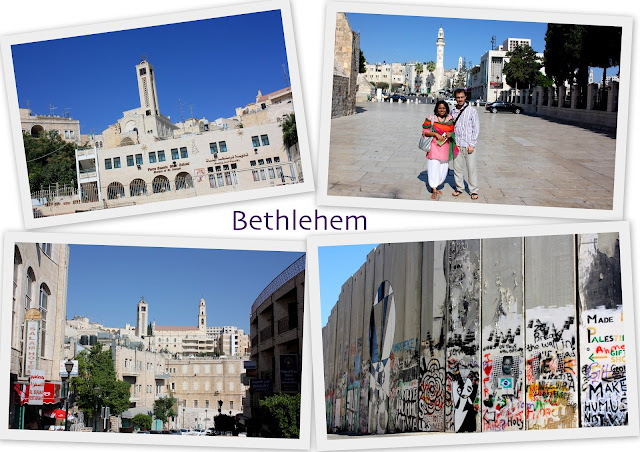 Bethlehem...the name itself evokes a sense of mystery! This ancient little city mostly known as the birthplace of Jesus! 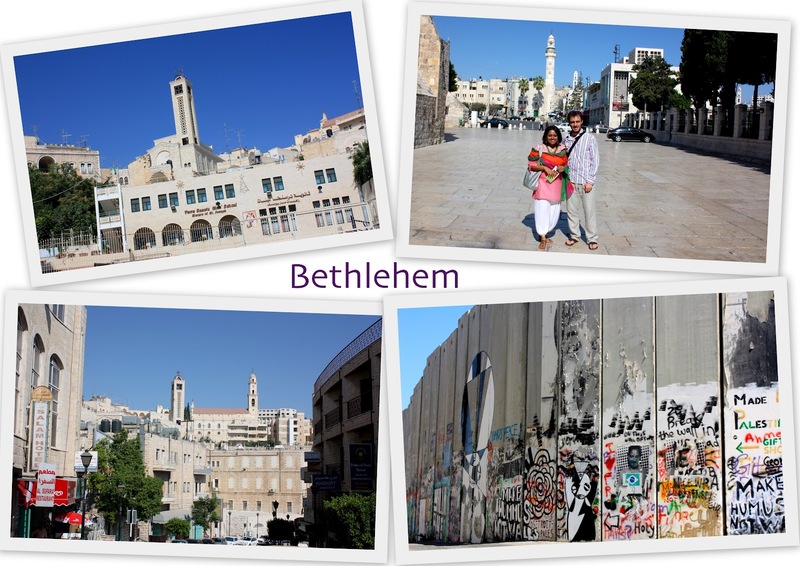 Bethlehem is a small city located about 10km away from Jerusalem. This historical city is part of the West Bank in the area administered by the Palestinian Authority. What this means is that it is not in Israeli territory but is in proper Palestine. Getting in to Bethlehem is easier if you take a taxi or bus with a local guide as most car rental companies do not authorize you to drive in Palestinian territory. So, we found a local guide in Jerusalem the day before and he agreed to take us to Bethlehem by bus the following morning. Within 15 minutes, we got to the Jerusalem - Bethlehem border where there was an Israeli security and immigration checkpoint. They don't really check when you enter Bethlehem but they do check when you return to Jerusalem. The reason being, by Israeli law, it is illegal for Israelis to enter Bethlehem and anyone caught doing so will be sent to jail. 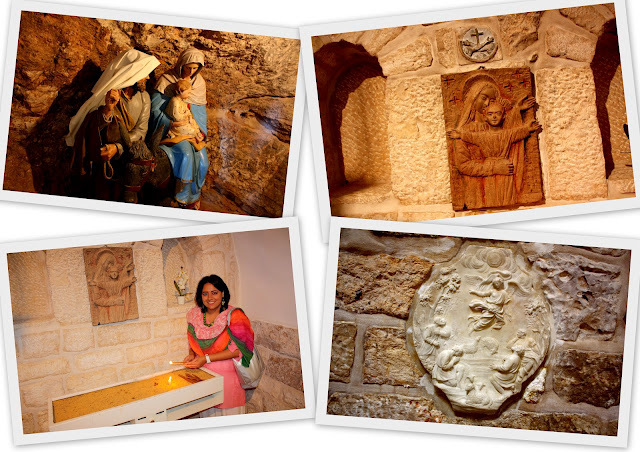 For foreigners like us, there's usually no problem to enter Bethlehem and return to Jerusalem. The first thing we noticed as we set foot on Palestinian soil was the huge wall that Israel has been constructing to separate Palestine from them. This wall has caused much worldwide controversy as it is believed to bring more harm to the people than anything else. Israeli authorities feel that this wall is a defensive measure and is constructed to prevent terrorist attacks. Palestinians, especially those living in Bethlehem, feel that the wall restricts their freedom and movement. There are petitions made to bring down the wall and the wall has art work and messages on it to express the Palestinians' opinions about it. Messages like "Make hummus, not walls" can be seen. It definitely felt strange to have this huge wall and not know what was going on on the other side. Our guide had arranged a taxi to take us to the main sites in Bethlehem and our first stop was the Milk Grotto. According to Biblical records, one day three wise men paid a visit to Herod the Great who was appointed by the Romans as the King of Jews. They asked Herod about "the one was being born as the King of the Jews" as they had seen a bright star and wanted to pay him homage. Taken aback by this news, Herod consulted his chief priests and learned that the new King of the Jews was born in Bethlehem. He conveyed this to the three wise men and told them to come back to him after they found the baby so that he too could worship him. Herod's real intention however was to kill this baby who was to take over as the King of Jews. He thus ordered the killings of all male newborns in the Bethlehem area, an event known as the Massacre of the Innocents. Meanwhile, in Bethlehem, Joseph had a dream which warned him that Herod was coming to kill baby Jesus. The three wise men found the baby and adorned it with gifts and just as they were about to head back to Herod, they too were warned in a dream not to go back. Sensing the danger that Jesus was in, Mary and Joseph fled to Egypt with baby Jesus and stayed there until Herod's death. While they were escaping, Mary was nursing baby Jesus and they sought temporary refuge in a cave. A drop of her milk fell on the ground in the cave and it immediately became white. Today, many couples who are trying to conceive or have a smooth delivery come to the Milk Grotto to pray for Mary's blessings. 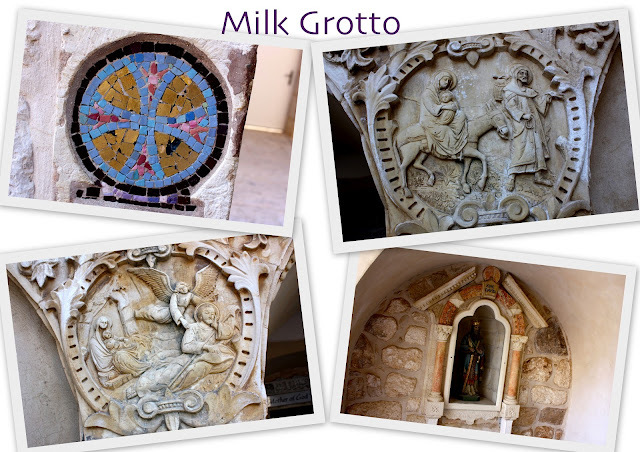 People believe that the grotto has special healing powers and brings fertility to couples who wish to have a child. In fact, the grotto staff apparently grind the white stone into a powder which is then sold to couples. There is a belief that if the couple mixes this powder in a drink for 9 days consecutively, they will conceive. The grotto itself was very serene and beautiful. Dimly lit with candles, it was very peaceful being there. 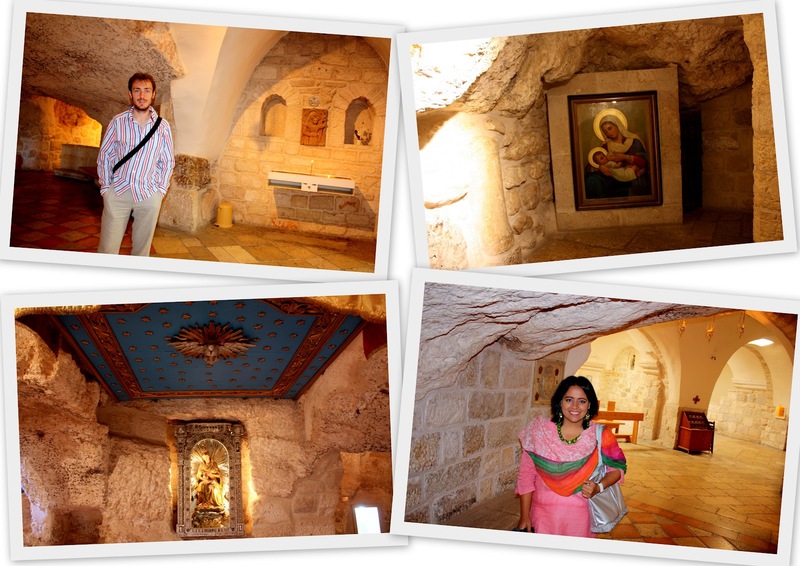 After the Milk Grotto, we headed to the nearby Church of Nativity, the actual birthplace of Jesus. This is the oldest continuously operating church in the world. We were quickly rushed in as the church was going to be closed to the public for mass prayers and so we were very lucky to go in and see everything. 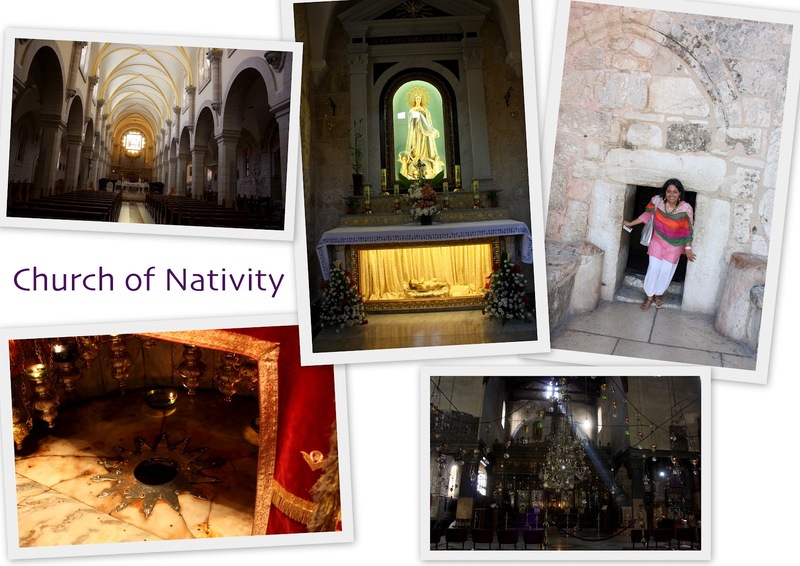 We first went to a place in the church known as the Star of Nativity. This is apparently the exact spot where Jesus was born. There were just 4 other people there so we could actually touch the star and offer prayers. It was an incredibly special moment! How blessed we are to actually experience this! I would have thought that being Jesus' birthplace, the church would be very crowded but in fact, it was practically empty! It seems that security concerns over the Israel-Palestine conflict have drastically reduced the number of visitors other than at Christmas when the place is packed. We also got to see the manger before being asked to move along. We learnt that the church is jointly operated by the Greek Orthodox, Roman Catholic and Armenian authorities, each holding their own prayer sessions. We then visited a little shop where we purchased a few souvenirs. I got a little bell with the Jerusalem cross and some incense to burn at home. Bethlehem was one of my favorite parts of the trip. I loved every minute of it - it felt so special to see and just imagine all these historical events taking place there. It truly was a privilege and a blessing to be in a holy place like that. I don't usually get this feeling of a supreme power taking over me when I visit most other religious sites (I've only ever felt it in the Golden Temple in Amritsar, our Tirupati pilgrimage and some other Hindu temples) but I felt that in Bethlehem too. A definite must-see for anyone who visits Israel! Next up, my adventures at the Dead Sea! Bethlehem is such a magic name. I grew up hearing about this city through religious classes and never thought I would be there one day. Quite incredible and magical! very well written kutty. good flow and unqie style in expressing the experience and ofcourse the luvly photos. I REALLY want to go that birth place of Jesus! © All content, images and videos are created and owned by Trevenki Productions. These can be reproduced on other sites, provided that you seek my permission.